New Delhi: A MoU was signed between Sashastra Seema Bal (SSB), National Skill Development Corporation (NSDC) and National Skill Development Fund (NSDF), in presence of Union Minister of State for Skill Development and Entrepreneurship Shri Rajiv Pratap Rudy and Union Minister of State for Home Affairs Shri Kiren Rijiju here today. During the event an android based and in-house developed mobile application “MySSB” was launched by Shri Kiren Rijiju. 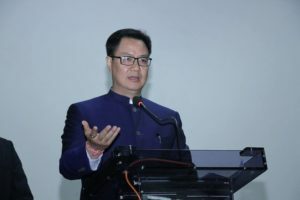 The Minister lauded the efforts in developing the application and expressed hope that SSB will continue keeping the welfare of its personnel on priority basis. Shri Rajiv Pratap Rudy said that the effort and contributions made by our security forces need to be recognized. He said that the paramilitary forces are highly skilled because of the nature of their job and his Ministry aspires to provide them better livelihood options for their future. He said that recently, a MoU with the CRPF was fostered and today we enter into a partnership with SSB, NSG and Welfare And Rehabilitation Board (WARB). He said that he is glad to share that, subsequent to his request the CRPF has decided to change the nomenclature associated with the skill set under which their employment framework is to be given a facelift and to make it more socially acceptable. The Minister expressed hope that other forces follow suit post this endeavour. These workforces are an important and integral part of our society and respect should be given to all those who possess skills in them, he added. This will also make skilling an aspiration and we can aim to attract more people to our mission. After signing the MoU, DG, SSB, Smt. Archana Ramasundaram said that SSB will be able to provide gainful employment to the retiring/retired personnel of SSB in-order to facilitate resettlement through generation of second career option. She said that the MoU will establish a framework under which dependants of SSB personnel as well as locals, school dropouts, victims and potential victims of Human Trafficking will also be benefited directly in the area/region where SSB is deployed. She said that the mobile application “MySSB” will cater to the general requirements and information of Force personnel i.e. accessibility to details of salary & allowance, GPF subscription, service particulars including posting profile, APAR etc. Presently, SSB has been deployed with its mandate to guard 1751 kms of Indo-Nepal and 699 kms of Indo-Bhutan Borders as well as deployed in the state of Bihar, Jharkhand & Chhattisgarh for ANO duties and in the state of J&K for CI Ops. duties. Through this MoU the unemployed educated/ uneducated youths will get an opportunity to adopt a course of their choice/earn their livelihood and plan their future. Skill development training programme will be organised in collaboration with Ministry of Skill Development & Entrepreneurship. Sectors like Apparel, Food Processing, Beauty and Wellness, Automotives, Security, Sports etc are given emphasis for the said programme.